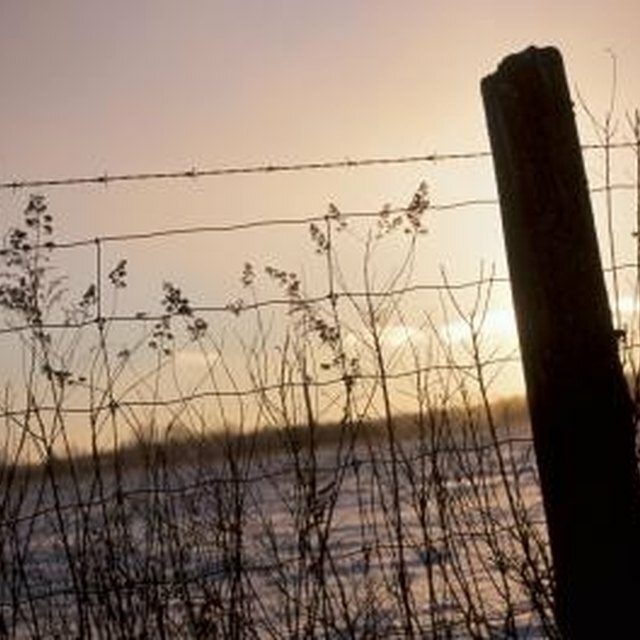 A barbed wire fence can last many years, but if the wire isn't tight enough, it will begin to sag over time. This means that the animals can begin to put their heads over, under or through the wires. Eventually, they may be able to get out of their pasture. Whether you're building a new barbed wire fence or making repairs to an old one, it's necessary to keep a fence stretcher in your fencing toolbox. If you don't have a fence stretcher, a come along tool works just as well. Keep barbed wire fences tightly stretched so animals stay confined. Set the corner posts, brace posts and line posts for your barbed wire fence. Decide where you plan to install the top row of barbed wire. Wrap the end of the roll of barbed wire around the corner post in that position. Twist the wire over itself several times to secure it. Put a steel fence post through the roll of barbed wire. Use the fence post as a spindle to unroll the wire. Unrolling it this way prevents it from tangling. Wrap the wire around the opposite corner post, but do not secure it to the post. You are going to stretch the wire before securing it. Cut the wire with wire cutters. Slide the barbed wire into the clamp end of the fence stretcher or come along tool. Lock it into position by sliding the clamp closed. Brace the fence stretcher or come along tool against the brace post, which is the second post from the end. Use the ratchet on the fence stretcher or come along to slowly tighten the barbed wire. Nail at least two fencing staples into the brace post to secure the tightened barbed wire. Situate the staples so that the tension of the barbs pushes against the staples so they hold the wire tight. Remove the come along or fence stretcher. Unwrap the wire from the corner post. Pull the wire tight by hand and wrap it around the corner post. Twist the end around the tight wire to secure it. Staple at least two fencing staples in the wire on the corner post. Place fencing staples in the opposite corner and brace posts to secure the barbed wire. Put fencing staples in the remaining line posts to attach the wire. If you are using steel fence posts, or T-posts, as your line posts, attach the wire with wire fasteners. Repeat the entire process for each strand of barbed wire. Install the barbed wire from top to bottom. Stretching barbed wire fence goes a lot easier if you have someone to help you. Let one person tighten the wire while the second person hammers in the staples. Barbed wire is extremely sharp. Wear personal protective gear, such as leather gloves, protective eye wear, boots, long pants and long-sleeved shirts to protect you from the barbs. Never use a tractor to pull barbed wire taut. Whenever possible, put a fence post between you and the wire you are tightening. The fence post can act as a protective barrier.